The center pivot is widely used for potato irrigation and represents a cost-effective, labor-saving solution. Potato plants are highly sensitive to over- and under-irrigation. Small deviations in water availability can decrease yields. 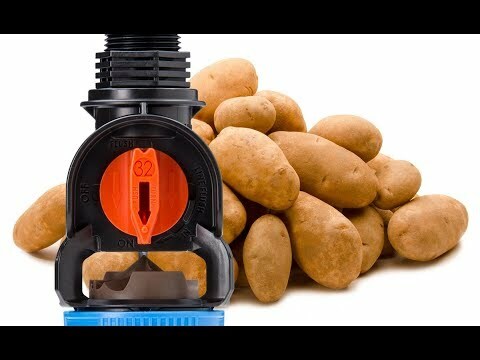 Nelson’s Rotator® Sprinklers with the Brown plate give you the optimum uniformity for your potato irrigation system. The Rotator's multi-trajectory streams are engineered to give you maximum throw distance, wind resistance, high uniformity, and less soil disturbance for more favorable growing conditions. This, along with efficient irrigation management, will maximize your crops’ yield and grade. Multiple streams allow for wet-and-rest application, and a larger throw distance gives your soil time to absorb water and protect hill integrity. A special feature at the heart of the 3000 Series is its unique, quick-change, easily identifiable nozzle, which now allows flow rate changes to be easily made in the field. Portable or permanent Solid Set systems are ideal in smaller-sized or unusually-shaped fields where it is not practical or possible to use a pivot. Using proven Rotator® technology, the R2000WF and R33 are the best sprinkler options for the high-valued potato crops. The R2000WF and R33 are direct replacements for aged brass impact systems. Field tested for performance and durability gives you high performance with less theft issues. Typical spacing for the R2000WF is 30' x 40', 40' x 40', or 40' x 50'. Typical spacing for the R33 and R33LP are 40' x 50', 50' x 50', or 40' x 60'. High uniformity and longevity give the R33 and R2000WF a clear advantage over the conventional impact sprinkler.